The question of installing wood floors using bamboo provokes many related questions. How much? What is the moisture content of bamboo? How do you even choose bamboo flooring when it looks like so many options are available? Due diligence is the simple answer. Easier said than done when bamboo, as a flooring material, is so historically new to the North American mainstream flooring industry. Consumers and flooring industry professionals are just learning the multiple distinctions of bamboo. Jason Wright is a Business Development specialist with T&A Supply, a family-owned flooring supply company anchored in Kent, WA, but with a reach spanning the Pacific Northwest and neighboring interior states. The company has navigated decades-worth of questions on installing wood floors, and Wright himself has faced them head-on for a quarter of a century. Wagner Meters felt Jason Wright’s expertise lay best in his experience of the consumer transition from purely wood products to bamboo circa 2000 to the present. The information he has gained has ranged from product knowledge to understanding pricing shifts for bamboo flooring. “Everybody loves the idea of bamboo, but nobody understands it,” says Wright. “From 2003 to 2011, there was a major push…that would drive down the pricing of bamboo. When bamboo was being sold at a higher price, people couldn’t understand why.” The answer is both complex and simple. Bamboo is officially a grass, but it is often categorized as exotic wood for those considering installing wood floors. 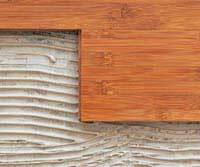 Originally, flooring manufacturers produced bamboo by harvesting chutes aged one to four years. The bamboo flooring was made from chutes (stalks) about three inches in diameter and contained 1691 pounds-per-square-inch (P.S.I.) of strength. Although priced at approximately $4.00-$5.00 per square foot, bamboo appeared to promise sufficient strength and affordability. Thus, bamboo was marketed as an inexpensive and effective alternative to wood flooring. Wright, as one practitioner with 25 years’ experience, reported that such bamboo floors performed poorly when the material was harvested and constructed horizontally. According to his clients, dents and gaps formed too easily. Wright contends that those flaws relate directly to the bamboo’s maturity. Put simply, horizontally-constructed bamboo was simply not strong enough, or old enough, to compete with the performance capabilities of older, more mature bamboo shoots. Repeated consumer experience has emerged as an immutable truth: immature, horizontally-constructed bamboo does not meet the grind of durable flooring performance as it was first produced. In 2006, the introduction of strand-woven bamboo changed everything, according to Wright, for several reasons. The strand-woven process fuses bamboo fibers with an environmentally safe adhesive under extreme pressure to form homogenous, high-density sheets that are sliced and milled into flooring planks. Strand-woven manufacturing peels strips from Moso bamboo, chutes which reach full strength and maturity at six years of age. 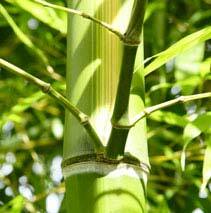 Moso bamboo has a diameter of between six and eight inches. Strand-woven bamboo flooring may cost $8.00-$10.00 per square foot. The hardness of bamboo using the Janka hardness test ranges from 1180 (carbonized horizontal), 1380 (natural) to 3000 for (strand-woven) bamboo. It is equivalent to Brazilian Rosewood (Tamarindo) at 3000. The Janka rating is a measure of the amount of force required to push a .444” diameter steel ball halfway into a piece of wood. In layman’s terms, it is a way to measure a wood’s resistance to denting. Strand-woven bamboo is manufactured according to a “hot-press” process, which basically microwaves the bamboo from the inside out. This process allows producers to completely cure bamboo at a six percent moisture content level. The product has a high success rate in dry climates, according to Jason Wright’s clientele. At six percent, hot-pressed strand-woven bamboo flooring has a dry moisture content which compares favorably with that of high-performing wood floors. There are presently relatively few hot-press bamboo flooring manufacturers in the world. “Cold-press” processing cures the bamboo by humidifying it from the outside in. The process is much less expensive, but cold-pressed bamboo fails in most cold climates. Due to its comparatively lower cost, cold-press processing is presently more popular with bamboo manufacturers. Consumers are wise to inquire on the method of bamboo processing with flooring retailers prior to purchase. When installing wood floors with bamboo, it is comforting to know that strength and durability are a fundamental matter of mature stock combined with sound processing. Hot-pressed strand-woven bamboo costs more, but ultimately will prove to be the longest lasting of the bamboo flooring options available today.